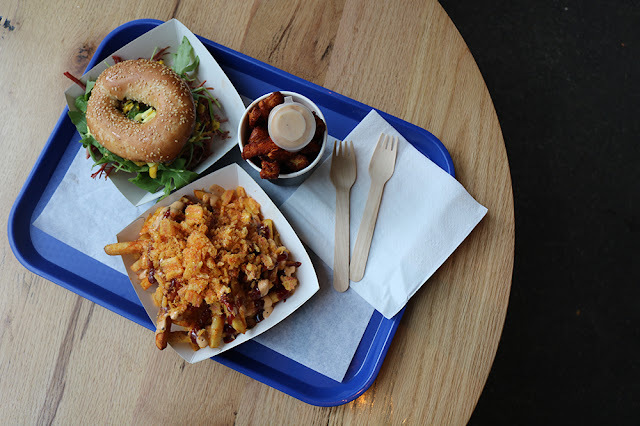 The American style van returns with those famous truffle fries, loaded hotdogs, burgers and this time they’ve got a few specials for us too. 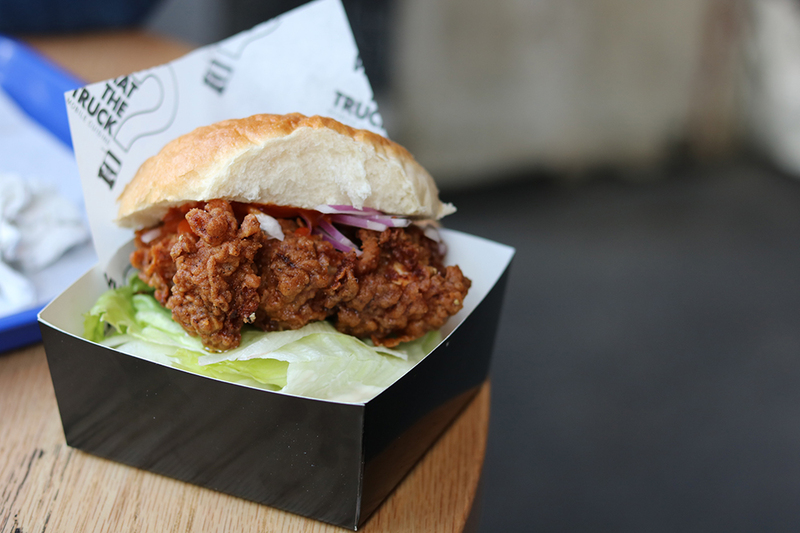 This time around I tried out the buttermilk fried chicken burger. In all honesty it wasn’t the best buttermilk chicken I’ve ever had (please return…), the chap took a bite and half of the chicken slipped out of the batter (and in to his mouth) leaving me with just batter and a bun. I think I’ll stick to the hotdogs and fries as there are no complaints from me about those! Another van to return to Trinity Kitchen. I remember their last visit fondly, even the pigeons enjoyed their presence in Trinity as they lapped up the leftovers the revellers the night before had left outside Tesco. That pineapple mayo was to die for. 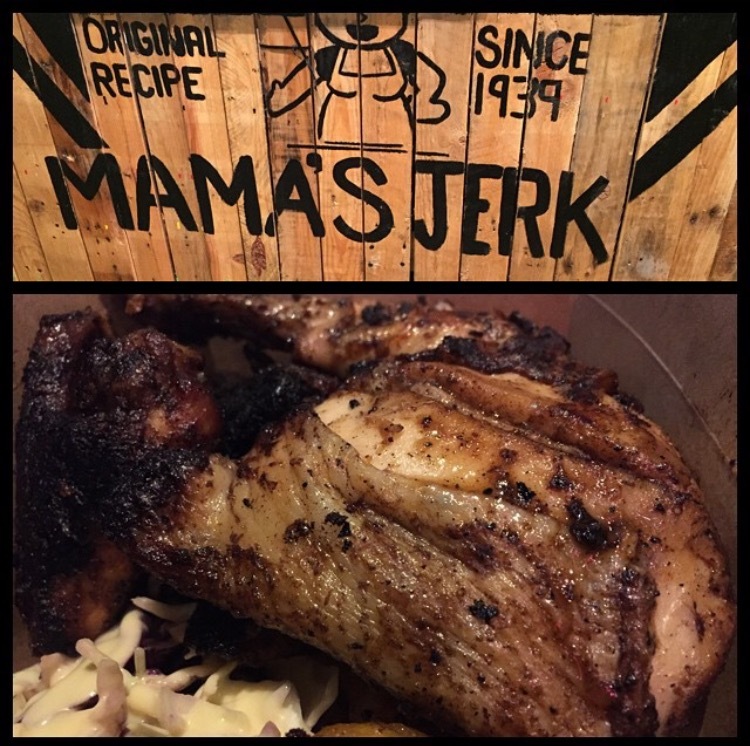 A very old picture of their jerk chicken! Usually found decorating the streets of Manchester, they have taken a trip to the right side of The Pennines to bring us their rap-star offerings. Featured on their menu you’ll find the Snoop burger, the Jay-Z amongst some great side offerings such as halloumi fries and fries topped with frazzles and baconaise. The meal deal here is £10 for a main, side and drink. The chap and I debated over sides and in the end decided to get both, sharing in Trinity Kitchen is a must if you’re to get the most out of all the offerings! 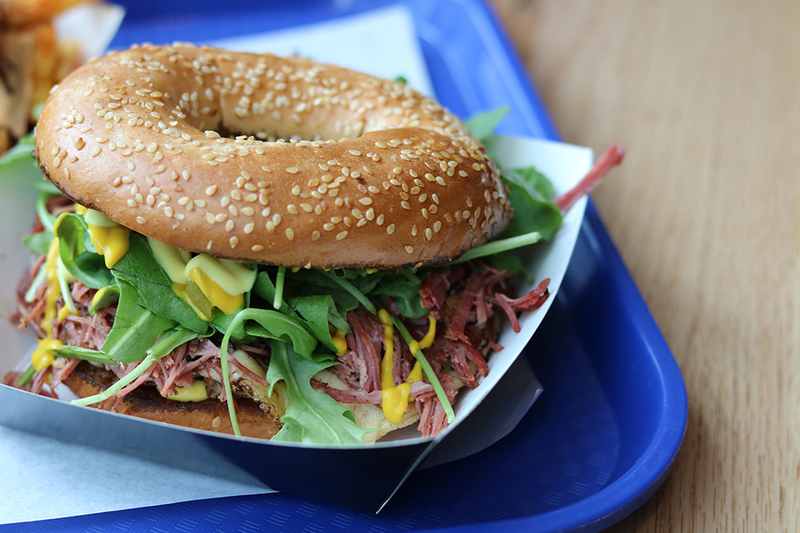 Our main consisted of the Jay-Z which is like a Reuben sandwich except made with a bagel. The Frazzle fries were unreal and I’m quite surprised that I didn’t have a heart attack afterwards. Side note, the chaps own this place are probably the nicest guys in Trinity at the moment and give excellent recommendations (not just for their own food). See my previous post here for their delicious delights! I’ve visited them so much over the last few months, it’s fair to say they are a favourite. They’re also still delicious if you have a cold, in case you were wondering! Lekker Eat Dutch primarily serve waffles and Dutch pancakes (think really small pancakes), typical of what you would find in Belgium and other Dutch countries. Big Grillie Style tipped me off that they were also serving bubble waffles, something I’ve wanted to try since I saw them a Manchester Food Blogger’s Instagram. My time had come. The bubble waffles are £5 and come with a choice of two toppings, two sauces and ice cream. I opted to have cream filled wafers, fudge (the Cadbury’s chocolate bar), toffee sauce and chocolate added on top of my ice cream and waffle. The waffle was steaming hot when it came off the press and the ice cream melted through its container, a napkin is advisable. I got the chap a milkshake. When enquiring about what shakes were available I was told “anything you like”, he opted for a strawberry milkshake, made with fresh strawberries, milk and ice cream. 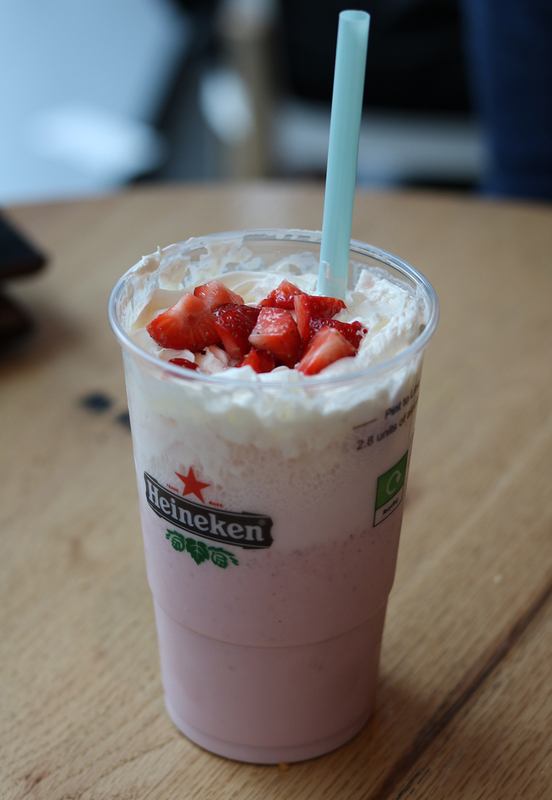 Served in a Heineken plastic cup. The day I visited things seemed to be a little all over the place, the chappy behind the counter was attempting to stir pancake batter by hand in a large bucket at the back. 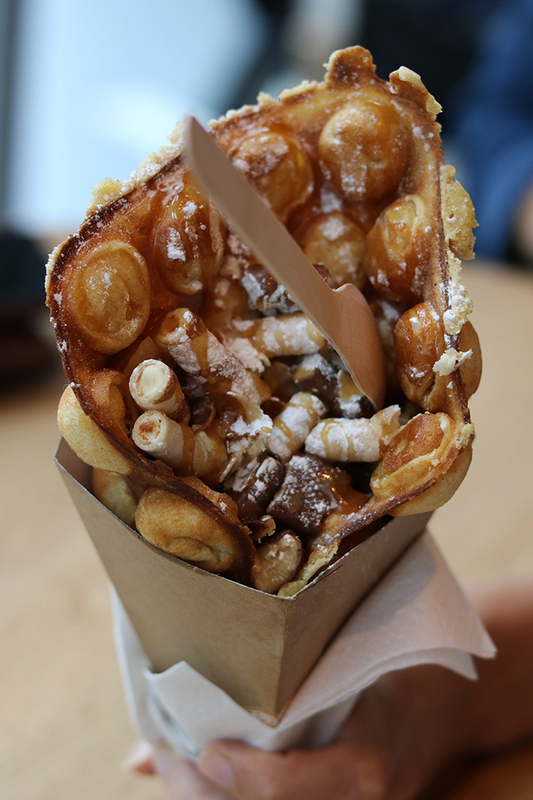 Another bucket that had batter dripped all down its sides was used to make my bubble waffle. The poor chap behind the counter had no spatula or tongs to remove my bubble waffle from the bubble waffle maker, resulting in him burning his fingers with some consistency. 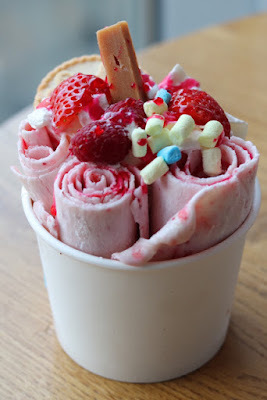 When I asked what toppings he would recommend, he shrugged his shoulders and said he didn’t know as he didn’t like sweet stuff and the other guy was diabetic so he wouldn’t have been able to help either. The other guy, that I presume he was referring to, was sat behind in the window balancing some books. My order of a waffle and milkshake was too much for one person to take on and a kid who really wanted some Dutch pancakes had his mum threatening that they needed to leave soon without his pancakes. This tugged at my heart strings and had she had made some obvious moves to leave I would have told the guy to leave my order and get the kids. Thankfully, when things started to crash around when the guy serving me had to wash the blender (with a hot water tap and a swill), the other guy got up from his table and took their order. Hopefully they’re more organised when it’s not a Friday night! So much of a hit they couldn’t bear them to leave, plus an additional space has been created for them outside of the normal run. Check my previous post for a video of the process. Go once, if only for the novelty.